The first day was cool, overcast, walking into a slight breeze. The emergency lane gave me all the room I needed to keep the World on the pavement and stay off the white "fog line". I tuned to the first local radio station on my soon-to-be obsolete "Walkman" AM/FM. I danced alongside the World, a slight two-step to my gait. Only a few stopped on this cool afternoon. The first pulled off within sight of the van. He was a church-goer on his way to haul Christmas Trees. The next was a woman with a bottle of water, a fresh Christmas Tree in the bed of her pickup truck. There was Mary Ann from the newspaper in Westmoreland, she had puffy colorful fingerless gloves. We talked about "drawls" and how Northerners won't let you leave just so they can hear you bend an "I" like a guitar string. I was within sight of town when Jim stopped and asked if I needed any help. He had read about us on the "Internet". He was willing to give me a ride from the nearby dollar store to my van. I had parked at the state line. Jim, it seems, had diabetes as a result of "agent orange". He recalled being in the jungles of Viet-Nam as the helicopters coated them until they were wet. I saw you today when I was on my way back from Macon County! 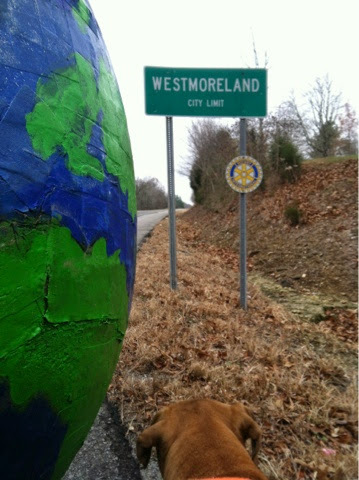 I posted on Facebook that I had seen a man walking his dog and a 6ft globe on the highway. My friend commented with this site and said, "you saw world guy!". I had no idea what your purpose was but now I do. I feel privileged to have seen you. I wish you well on your journey and any future adventures! With Kindest Regards, Rebecca Wyatt from Sumner County, TN. Seen you along the rd in my small town of westmoreland and thought now that's something u don't see everyday and expecally on such a yucky day. Looked you up on the internet and brought tears to my eyes. I along with my mother and a few other family members have diabetes.and its awesome we have ppl in this world who world bring awareness like this. You made my day and YOU ROCK! !